Interesting texture. Good choice òf colours. A beautiful card Kirsten, hmmmm, I think I have that stamp!! 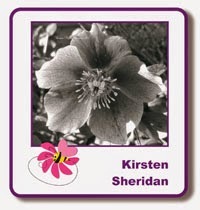 Another good card ,Kirsten,I used this syamp at class, must check to see if I have something similar. Love the touch of sparkle with the EP and the background is lovely.